We are a student-focused program that encourages you to take more control of your academic and professional development experiences. CSR Tuition Support: CSR Scholars (except for Associate Scholars) can earn tuition support for participating in CSR student-development programming and/or by engaging in specific student-researcher development activities with/overseen by their faculty mentors. Tuition support amount varies by Scholar category and activity. CSR Travel Grants: CSR Scholars (except for New Pioneer Scholars) qualify to submit CSR Travel Grants to the CSR. Successful grant proposals cover the cost (up to a pre-designated dollar amount) for travel to professional conferences related to the student's CSR-associated research or creative activity project. CSR Supply Grants: CSR Scholars (except for New Pioneer Scholars) qualify to submit CSR Supply Grants to the CSR. Successful grant proposals cover the cost (up to a pre-designated dollar amount) for consumables needed to complete the student's CSR-associated research or creative activity. CSR-SP selection is competitive, but not GPA- nor discipline-bound. We encourage students at all academic levels (freshmen through graduate students) and levels of academic preparation to apply! Please note that the application window for the CSR Scholar's Program is open following the end of the current academic year and closes at the end of the first week of Fall semester. The Center for Student Research office is located in the Student and Faculty Services building on the third floor: office SF-335. The office is open Monday to Friday from 9am to 5pm with the exception of meetings and workshops. Michelle Hobbs-Helmus, our Program Coordinator (and Cal State East Bay alumna! ), will list her schedule out on the CSR door, daily. To schedule a meeting with Dr. O or Michelle, please email the CSR email at csr@csueastbay.edu. If you have any CSR paperwork/forms that you wish to drop off and Michelle is not in the office when you stop by, please drop the forms off in our CSR drop box, either in SF-302 or, if it is after 5pm, in the lock box located right next to the CSR office door. 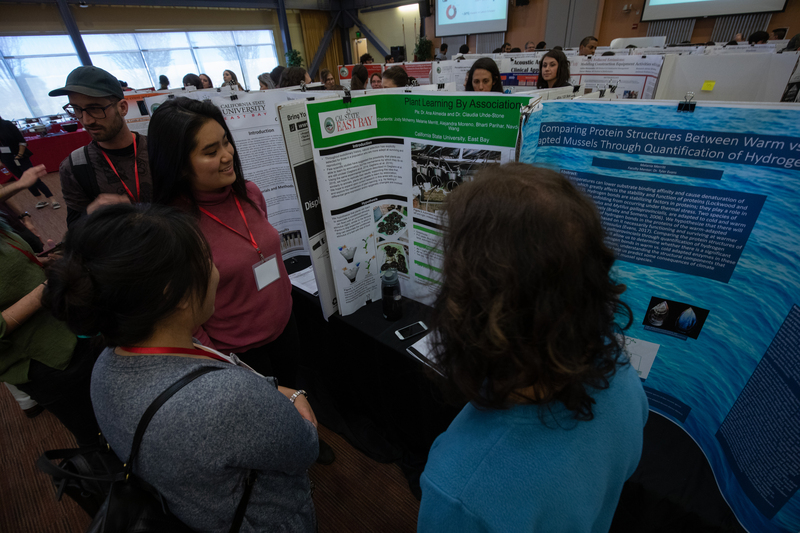 All CSR Scholars are required to present a research or creative activity poster (regardless of the phase at which you are at in your given research project*) in the Cal State East Bay Student Research Symposium (SRS) being held on campus (Wednesday, April 17, 2019 from 12-2pm). This event is a great opportunity to share your research with other Cal State East Bay students, faculty, and administrators and staff! Last year, we had approximately 250 participants and attendees! *During the CSR Poster workshop, we give poster tips on how to accomodate different phases of project progress (so be sure to attend that CSR workshop if you want advice on preparing your poster for the SRS). 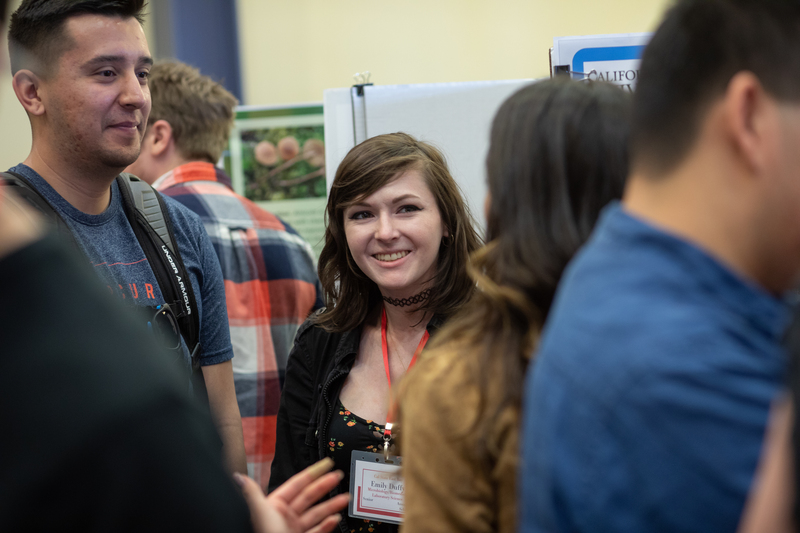 Verbal presentations will run between 9:00am to 12:00pm (optional partcipation, unless you are selected to represent Cal State East Bay at the Statewide Student Research Competition). If you would like to do a verbal presentation (10 minutes + 5 minutes of questions, please email us). The poster presentations will run from 12:00pm to 2:00pm, you must be present at your poster, unless you have a scheduled class during that time (you must email us, we will check your course schedule, and then excuse you, if that is the case). Even if you cannot attend the Symposium, you must submit a poster to be displayed, and if at all possible, send someone (faculty, another student) to represent you and your work. You must work with your faculty mentor to create a conference poster of your work. The completed poster must be emailed to the CSR no later than 5pm on March 27, 2020. More details can be found, RESEARCH SYMPOSIUM. You must also register at RESEARCH SYMPOSIUM as a Sympoium participant (so that we can prepare the sympopsium program that will be distributed to participants) by February 14, 2020. For the time being, please begin discussions with your faculty mentors about getting started on your posters! Are you a Cal State East Bay Student Looking for a faculty research mentor? See our "want ads"! On this page, we have posted information from different faculty members who are looking for you!